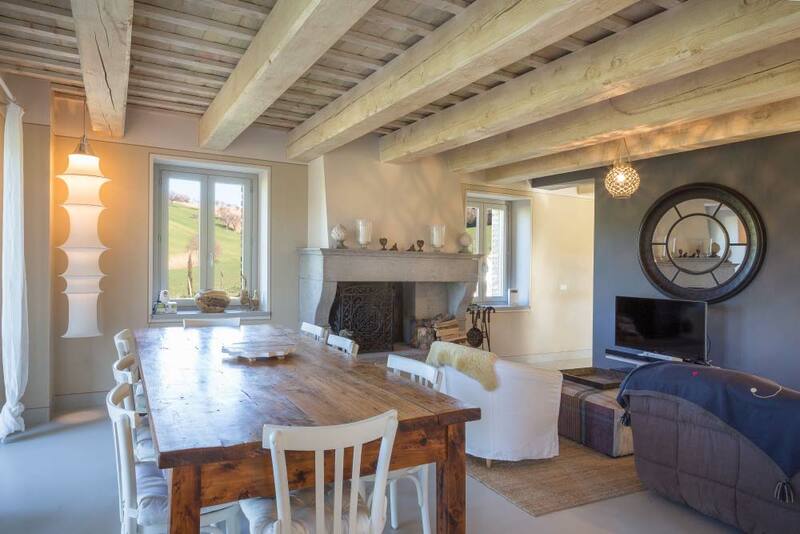 The peculiar feature of this farmhouse is its location: near a beautiful centuries-old mulberry tree. 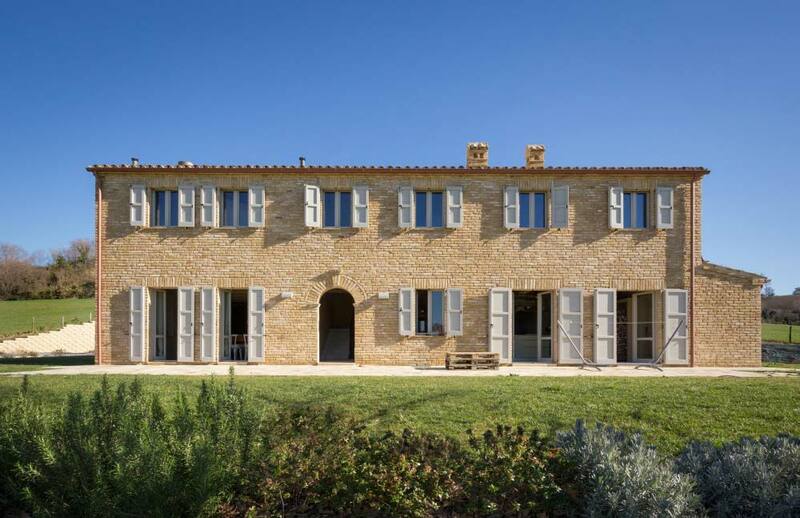 The structure of building was modified over two or three periods, and it was in a highly compromised condition. 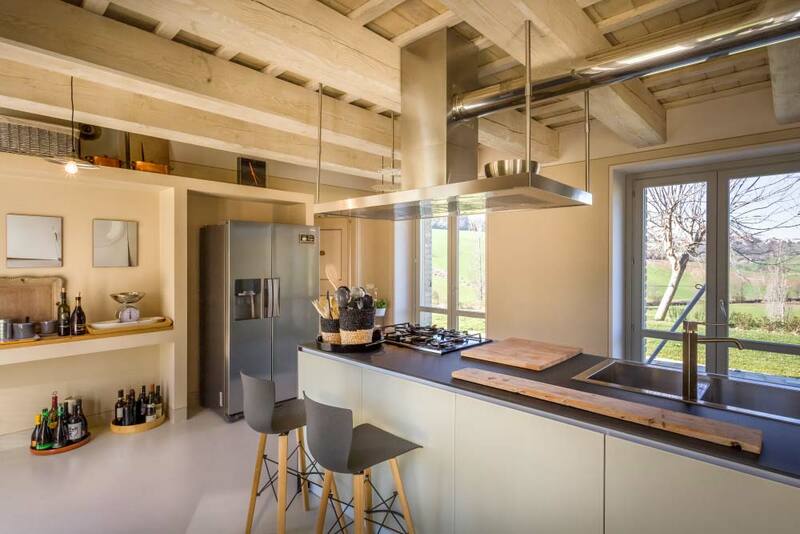 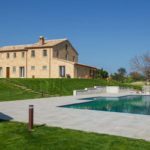 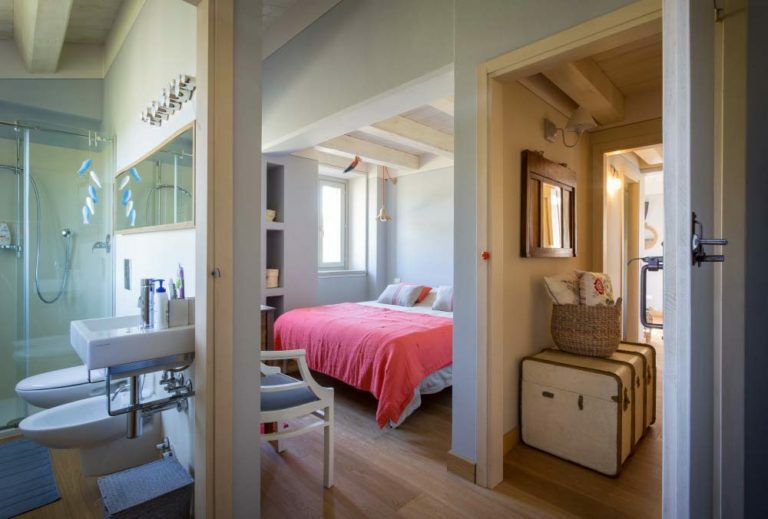 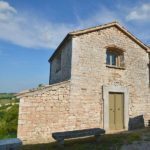 For this reason during the restoration of the farmhouse, it became necessary to disassemble and reassemble everything in the same position, slightly diversifying only the altitude to finally have a garden. Every Casa Colonica (i.e. 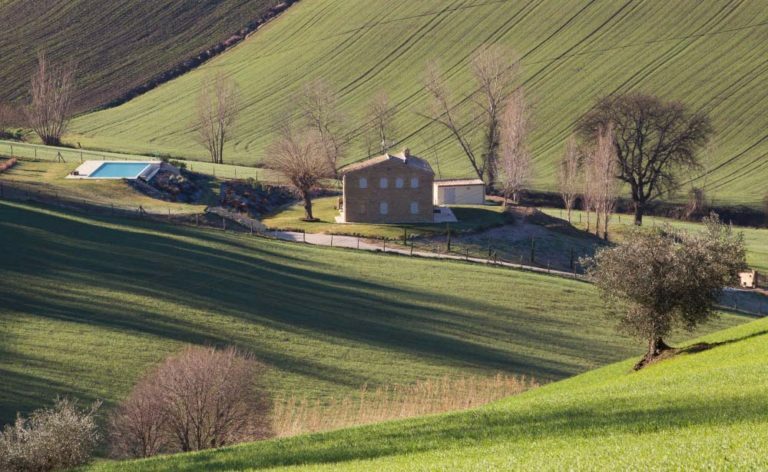 a local farmhouse) has a road that surrounds the house, to satisfy the farmer’s need, creating some kind of a roundabout with the property at the center: it might seem outdated, that in our projects we usually change. 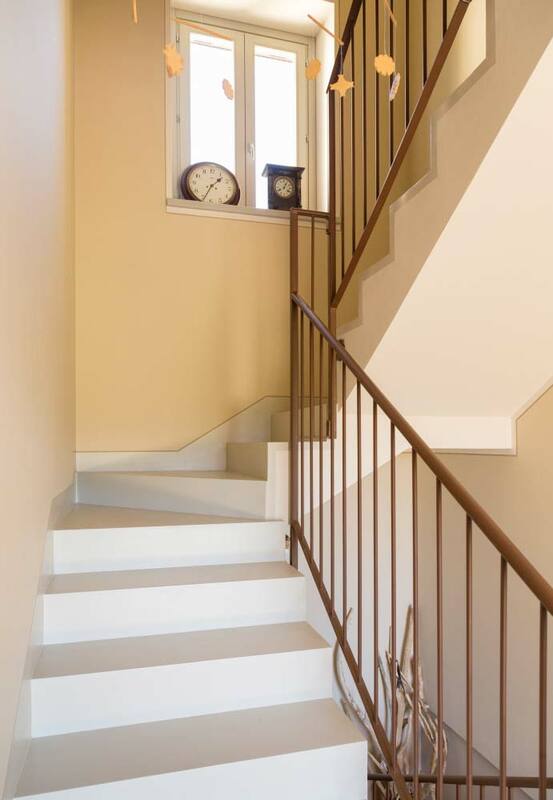 As in this case, the garage is usually underground. During the renovation works for the farmhouse, a cellar was built, which did not exist before, and the masonry wall was reused. The structure has been improved in terms of earthquake proof structure and thermal efficiency and the colored concrete and resin floor has been equipped with underfloor heating. 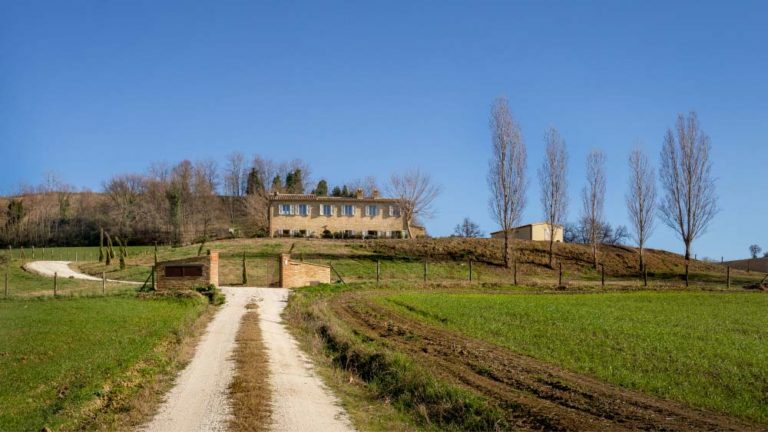 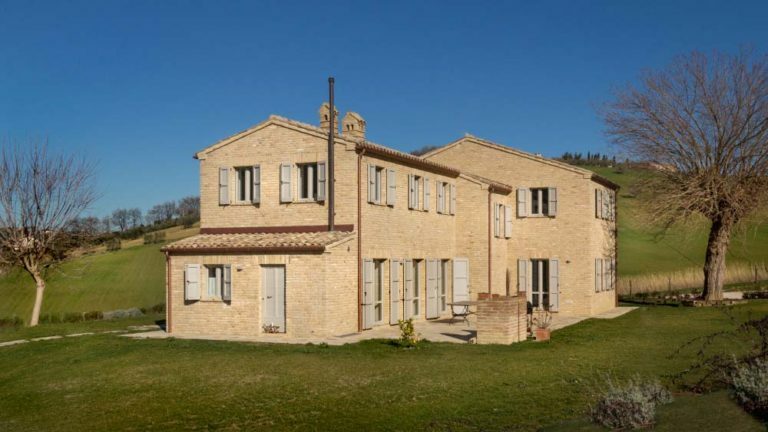 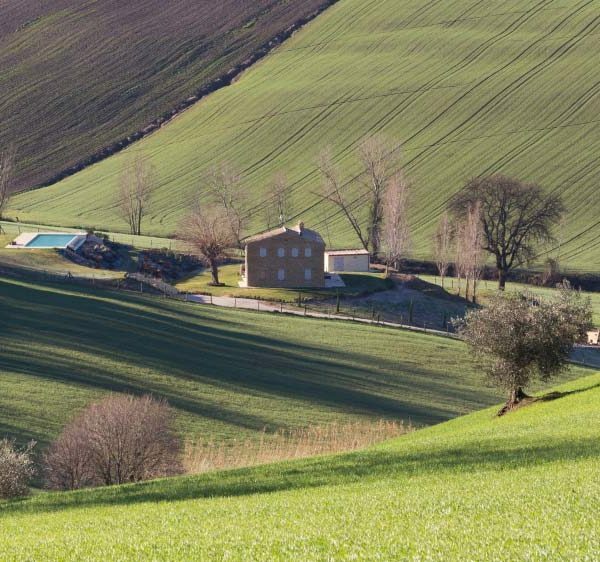 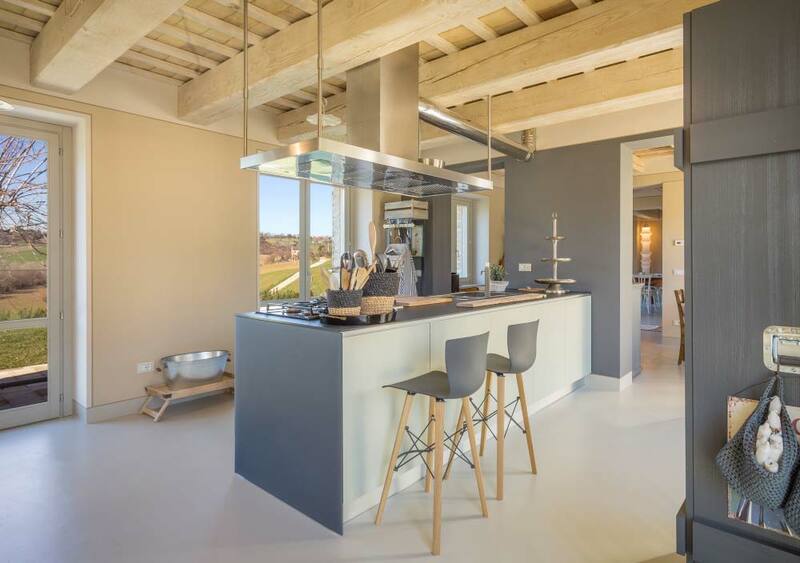 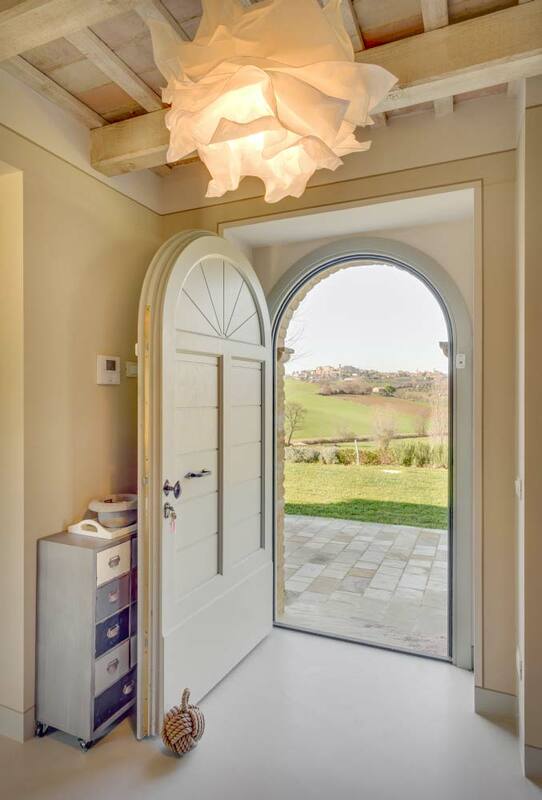 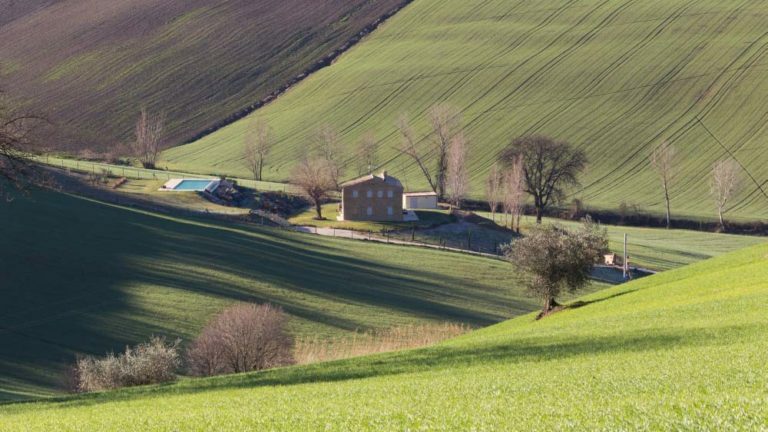 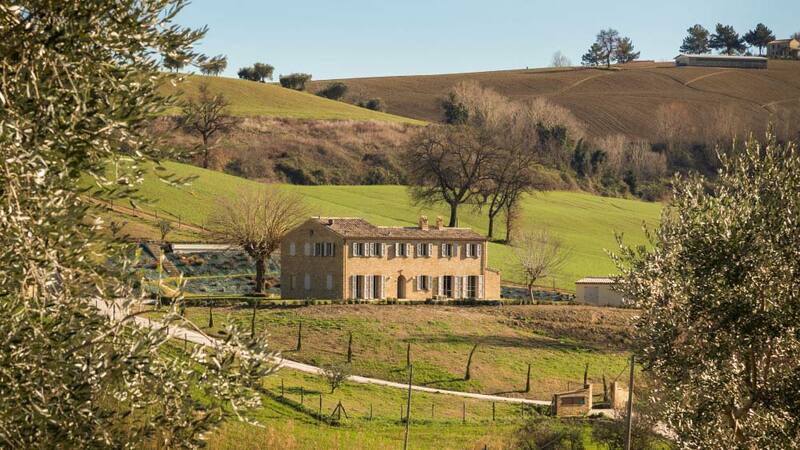 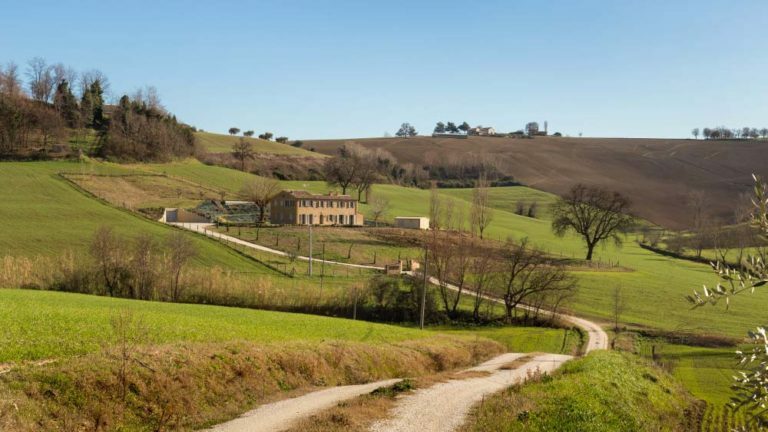 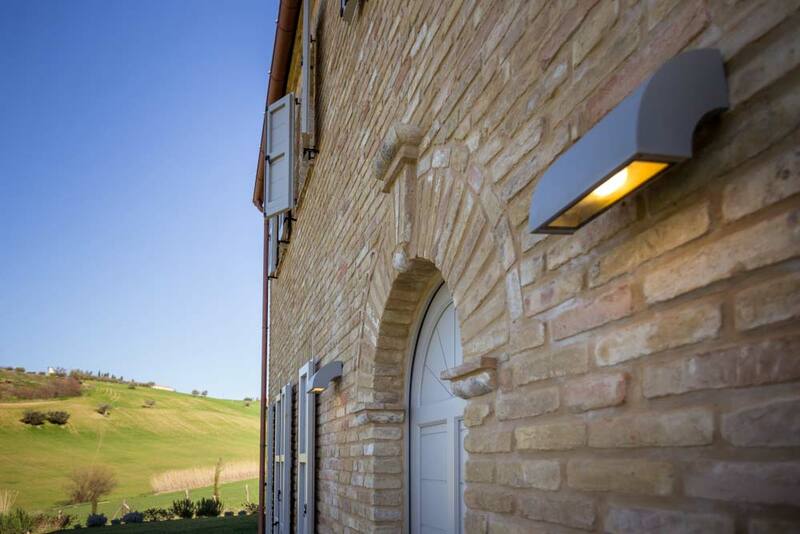 On the outside, therefore, the house keeps a very classical shape, according to the regulations in force in relation to rural building heritage of the region Marche. 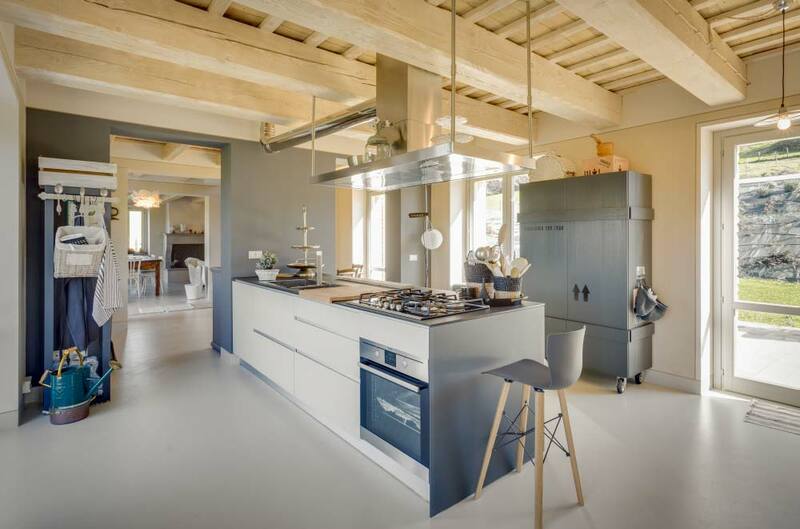 Indoors, modernity expresses itself, given by this colored resin in light gray that creates a continuous carpet and that is intentionally coupled to the color of the beams that have not been exposed. 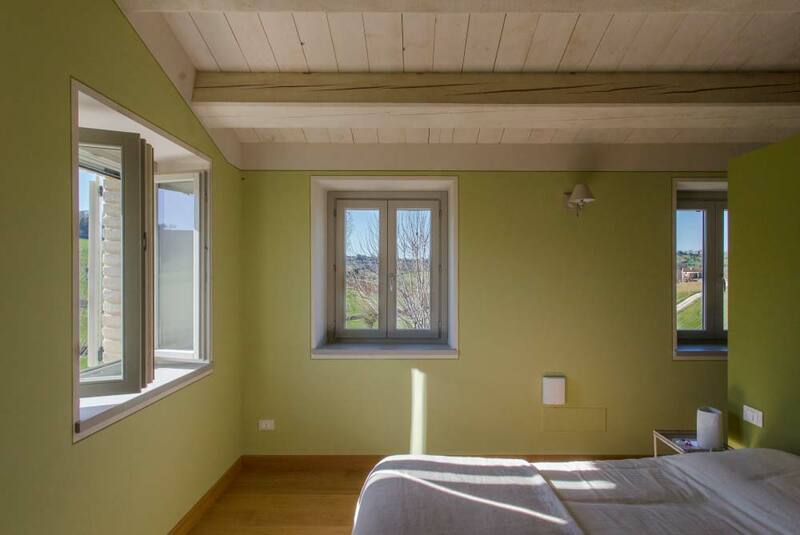 There are several windows and there are large rooms with passing views, it could have a double use: when it is very hot, the southwest side is more exploited, while the southeast side is colder. Therefore, it does not have a predominant side. 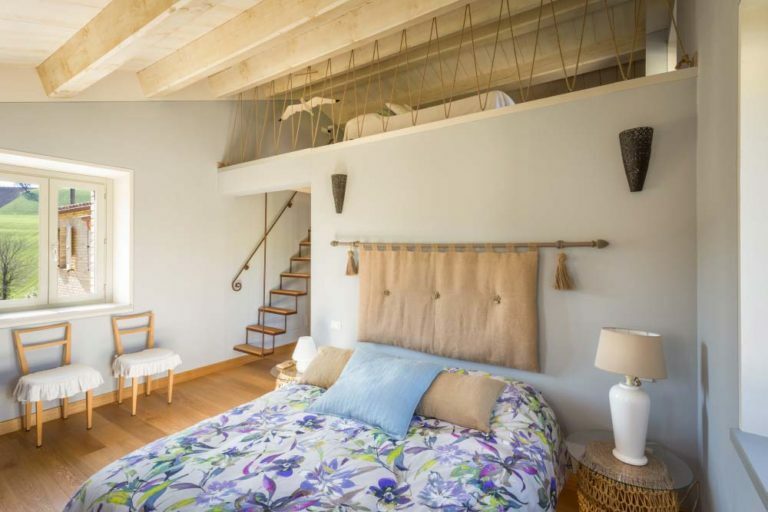 On the first floor, there are three bedrooms: two for guests and the master bedroom with its own bathroom and dressing room. 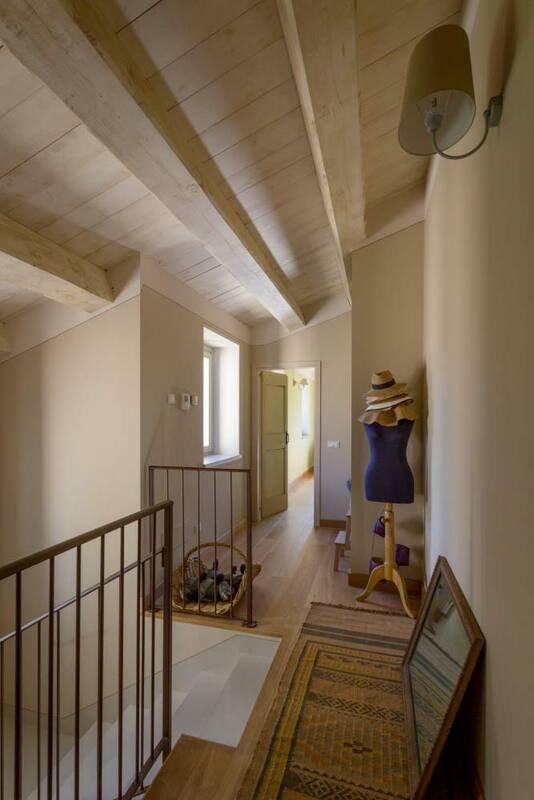 The floor is in classic light oak wood, while in the bathrooms no tiles have been used, but only resin. 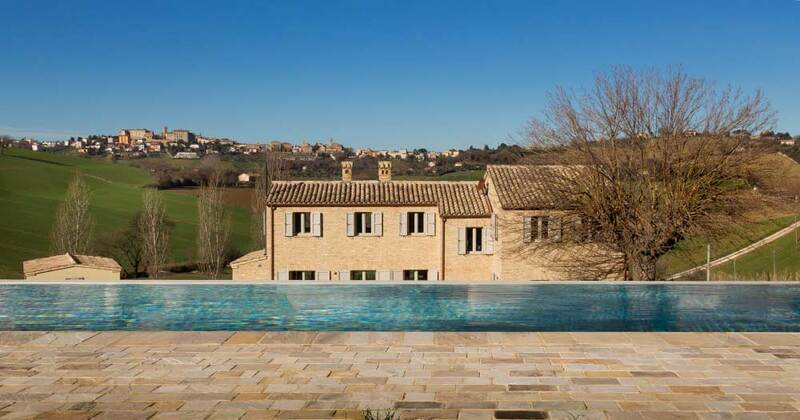 The pool is not placed in front of the house but above, to enjoy the view from a privileged position and have the skyline of the village on the background.